This entry was posted on September 19, 2017 by Marketing. Atlanta is a city full of history and Southern Charm. Add to that incredible diversity, good weather, and a booming economy, and the city that gave us Coca-Cola is a great target for real estate investors. The Atlanta Journal Constitution reports that the median home price increased by 7% in the first half of 2017 to $240,695. The number of sales went up 4%, to 32,737 homes sold. The average house was on the market for 52 days, but in Cobb and Gwinnett counties, houses were snapped up in an average of only 33 days. According to a study published by USA Today, Atlanta suburb Snellville in Gwinnett County has the ZIP code with the 10th highest projected appreciation for the next five years. Atlanta has a thriving economic climate and is the headquarters of many Fortune 500 companies. Most famous is Coca-Cola, long a central pillar of the Georgia city’s economy. The home of CNN, Delta Airlines, UPS and AT&T Mobility, Atlanta provides a diversified economy and a strong market that is more resistant to downturns. The opening of the Atlanta Braves’ new home in nearby Smyrna (Cobb County) has created investment opportunities nearby. The ballpark opened in time for the 2017 season, with the Braves playing 81 home games per year. In addition to the new park, developers are planning new restaurants, a live music venue, a luxury hotel and upscale residences. Sean Black, the CEO of Knock, an online home sales startup reported, "Developers continue to build in the area, and people continue to buy. Approximately 13% of nearby homes that sold within the last 180 days were newly constructed - and those new homes went for a median price of $450,000. People are seeing the value in the area, and they’re investing in it." Atlanta is adding new residents and jobs at levels not seen since before the Great Recession. According to data released by the Atlanta Regional Commission, the Atlanta metro area added 78,300 people from 2016 to 2017, for a population of 4.9 million people. Included in that is an addition of 9,900 in the city of Atlanta. Mike Carnathan, manager of ARC’s Research & Analytics Group, shared in the Atlanta Business Chronicle that the region “was slow to emerge from the recession, but strong growth in the past few years shows that our recovery has taken hold.” The strongest growth was seen in the northern suburbs, led by Cherokee County. This growth has been fueled by an influx of multi-family housing and a hot job market. In the past year, the Atlanta metro area ranked second to Dallas/Fort Worth in the number of new jobs, at 87,000. 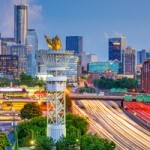 According to the U.S. Conference of Mayors, the Atlanta metro area is projected to grow to nearly nine million people, which would make it the sixth largest metro area in the country. That would be a 48.7% increase in population. Clearly there is an ongoing need for housing to accommodate this kind of growth. 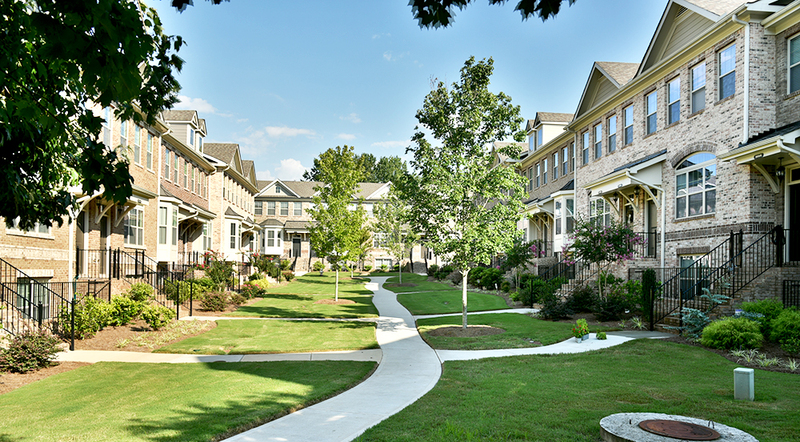 If you’re a real estate investor who is thinking about investing in the Atlanta real estate market, consider your funding options at Patch of Land. We’d love to speak with you about your project! Connect with us today. This entry was posted in All Projects, Building Wealth and tagged atlanta, housing market, real estate investing on September 19, 2017 by Marketing.